Undertaking a grading allows students to prove to their friends and family that pole dancing has evolved and there is more to fitness pole dancing than simply wiggling your bottom around a pole. Congratulations on choosing to pole dance - and welcome to the community! You are joining a wonderfull and vibrant community and a fitness based sport that is evolving day by day. If you are not already doing so, we do recommend that you train with a PDC Approved instructor. This enables us to ensure that you are recieving great instruction from a trusted source at a fair price. We can also liase between you if ever there are problems. If you train with an instructor who is not PDC Approved, please pass on our details to him/her. Just as we provide a benchmark for instructors, we also give you, the pole dance students a grading system that you can use to asses your own progress and compare it with other dancers from other studios all over the world. So whether you are taught 1 to 1 by an expert in a famous studio or if you just train yourself at home watching youtube pole dancing videos - you can shine just the same. We have called our grading system, the Advancement and Accreditation Program (or AAP for short). By combining the wisdom and experience of our 500+ member instructors, the AAP is recognised throughout the fitness pole dance industry and is being used by pole dancers from all over the world who enjoy the challenge and recognition it provides. progress and the book and certificates are great to show off to your friends! Your 1st years AAP membership costs £30 (plus p&p) and includes the cost of one FREE online grading, your AAP book (pole dancing passport), entry into the pole dancer's database on the PDC website, use of the AAP logos and £5.00 off the PDC Syllabus Book. Subsequent years membership is just £10. If you dont yet have your AAP membership, your PDC Instructor can order one for you (ask him/her) or you can buy straight from this site. Once you have graded, you may use these logos on your websites and Facebook pages. Some of the grading videos we have been sent are really beautiful and we would like to recognise those dancers for their skill, over and above the certificates they earn for passing. So, we have introduced a new, more detailed grading exam which allows the assessor to not only pass/fail the dancer, but also to provide a merit and a distinction where deserved. 4 Melody Breen Made You Look Fitness inc. Your privacy is paramount to us. All AAP members can opt in or out of appearing on this list. If you have graded but are not on the list, please let us know that we have permission to add you. Conversely, if for whatever reason you do not want to appear here, just mail us and we will remove your listing. We have over 1000 graded dancers. 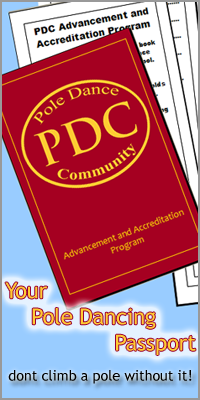 Pole Dance Gradings with the Pole Dance Community - Get Recognition. So how many of you work hard to learn new pole dancing moves but then fail to get the recognition you deserve? Do friends and family respect your chosen dance/fitness genre or do they chuckle and make snide comments? How many people know about your pole dancing instructor and how much they have taught you? To be taken seriously in any sport you want recognition for your hard work and the PDC Pole Dance Gradings are the perfect way to chart your pole dancing progression, create new goals and promote pole dancing to your friends and family. Once again many thanks - that's the quickest I've ever achieved a new years resolution! Gradings are also perfect for those of you who can't find a pole dance school near you and who learn in the comfort of your own home spending hours watching Youtube and checking out the pole dancing pictures of those you admire. 1. Buy your AAP membership. This is your first year membership (renewal currently costs £10 per year). Your AAP membership allows you to partake in gradings and gives you one free on-line grading. AAP members also receive regular updates from the PDC as well as special members discounts. Buy direct from the PDC website or from any PDC Approved Instructor. 2. Plan your grading. Decide which level of the PDC Syllabus is the most appropriate for you. Don't rush to achieve higher gradings, work through the lower levels and learn safely at your own pace. If you train with a PDC Approved instructor then they can help you with this process. If you train at home on your own then take a look at the grading sheets (pictured right) used by PDC grading assessors to mark the gradings. Pick your 10 chosen moves from your preferred level. Check out our amazing free on-line syllabus. If you would like a copy of these grading sheets just e-mail us with the title 'Grading Sheet Please'. 1. You need to demonstrate a warm up that is suitable for your moves and level. 2. Execute your 10 moves in isolation. 3. Demonstrate the same 10 moves contained within a routine. 4. Finally you need to demonstrate a cool down element that reflects the moves you have performed in your grading. 1. Youtube - Upload your videos to youtube and then send us the link for each video. You can set your videos as unlisted so that we can view them but no one else can see them unless you send them the links. 2. File Sharing Program - Using a program such as dropbox you can send us a shareable link. When you look at your shareable folder there will be an option to create a shareable link, copy the shareable link then send it to us so we can pass it to one of our grading assessors. Please don't just make the folder viewable to the PDC e-mail address as we are then unable to forward it to a grading assessor. To submit your grading you will need an up to date aap membership (Full membership or electronic membership). Each membership includes on free online grading. If you have already used your free online grading you can purchase another one for just £15 by dropping us an e-mail. So what else do you need to to know? Pole Dance Grading Costs - first on-line grading is free and subsequent on-line gradings cost £15 each. Ask your PDC Approved Instructor what they charge to grade you in-house. Certificates can be bought after your successful gradings at a cost of £5 plus postage (some PDC Approved instructors include this in the price of your grading). To see some examples of video gradings just pop into Youtube and search for PDC pole dance grading. "When you undertake a grading you get detailed personal feedback on your performance from a PDC instructor, this will help you to develop your own personal skills and become a better pole dancer." Your exam will be marked out of 130 and you need to score a minimum of 60 points to pass. If you reach 90 points you earn a merit pass and 115 points will earn you a distinction. The first ever student to successfully complete levels 1-5 of the PDC Grading Program was Alex Backhaus from Northern Pole Dance in Newcastle. Alex trained under the watchful eye of PDC Approved 4 star instructor and grading assessor Aimee Lawson. Alex was presented with an award for her achievement in the form of a glass trophy (Alex pictured left with her trophy). 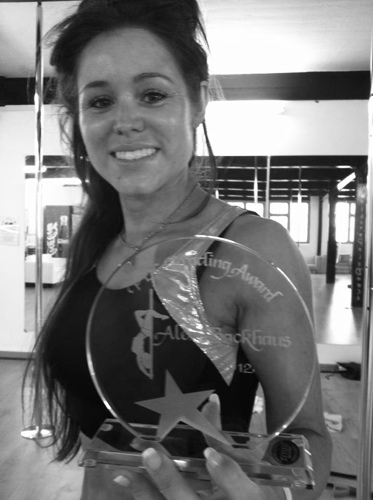 Read more about Alex Backahus and her pole dance grading award. 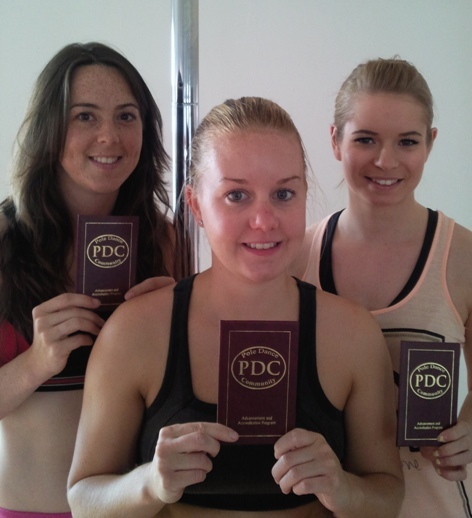 The first ever PDC Pole Dance Grading days were set up by Approved 4 star instructors Ally Franklin of Polelatis (UK) Karen Currie of Princess K (UK). The grading days allowed students to work together to prepare for their gradings as well as to share their nerves. Both schools have seen considerable grading success as you can see from the table of graded dancers. So how do you rate and do you think you could make the grade?